Located on the west side of downtown, Montréal-Pierre Elliott Trudeau International offers instant access to the massive city of Montréal, not to mention onsite amenities that cushion the blow of foreseeable traffic and large crowds. Get through it all by knowing you’ve got a ride waiting, either with a private rental perfect for exploring acclaimed French architecture or a meet-and-greet service that gets the job done. Also keep in mind the ever-lasting help of shuttles, which offers the perfect balance of cost and comfort. Find other destinations that offer GO Airport Shuttle or search for other transportation providers at Montréal (YUL) airport. Montréal–Pierre Elliott Trudeau International offers ample parking for all of its passengers and guests. Trudeau Airport is home to several STM bus lines, the most popular day routes being 204 and 209, while night routes are offered by 356 and 378. For whenever rides, take advantage of the 747 Route, which offers exclusive 24-hour access to downtown, 7 days a week. Subway stations are not as accessible as bus lines, with Namur Station, located at The Triangle 7 miles (11 km) away, being the closest option. Take charge by booking a shuttle instead, reserving through either local shuttle or sedan providers for a ride that offers custom drop-offs and special accommodations. The ambience and friendly atmosphere at the Old Quebec offers you a insight of the European charm. Take our private sedan and drive safely to this fascinating atmosphere. For those in search of intimate moments, look no further than the cabin of a private sedan. Make arrangements with area sedan providers to take quiet with you everywhere you go, passing through the lush landscape of Îles-de-Boucherville National Park, which famously rests on an island at the heart of the St. Lawrence River. There is a lot of history at the Quartier du Petit Champion. Date back to 3000 years ago by taking a private SUV to this destination. Learn about the history of the natives of this city. Take care of up to six passengers with a private SUV by your side, the perfect family vehicle for exploring Montréal’s softer side. Book with local providers to take your time Jean-Drapeau Park, an iconic pair of islands sitting in the St. Lawrence River, offering a theme park, museums, and high-speed race cars. The Terrase Duffein offers you magnificent views of nature. If you prefer historical walks, you are definitely at the right place. Go elegant when you hit the town, booking a stretched limousine for instant elegance after baggage claim. Reserve through area limo providers to enjoy starry-eyed sceneries, grabbing an upscale bite at Garde Manger, or looking forward to a dinner-and-show ambiance at the famous Rialto Theatre. When it comes to airports transportation, pour taxicab services are the leaders in the industry. Let us drive you to some of the most toured destination like Lower Town. Whether you’re arriving to the massive Montréal Convention Centre or Palais des Congrès de Montréal next door, be prepared to get through large crowds and narrow traffic with the strategic hand of a taxi, enjoying the expertise of back-road knowledge alongside 24-hour access perfect for taking your time at the after party. We take pride in our highly knowledgeable local personal drivers. Let them offer you an authentic ride to the Montmorency Falls Park. It includes a number of waterfalls and state parks. Find less obvious landmarks with the assistance of a local personal driver, finding beauty through the eyes of someone who’s experienced it, from early-morning cafés in Le Plateau-Mont-Royal to independent museums and performance art swimming through the streets of Griffintown. There is no better place to be that compares to the Place Royale. Be part tremendous historical walks. Utilize the expansive subway system to save time and money, booking a shared ride van with area shuttle companies for one-time rides to all-in-one stays, whether it’s the upscale Hyatt Regency Montréal or the even ritzier, Sofitel Montréal Le Carré Doré, both of which offer less than a block’s walking-distance to metro stations. La Citadelle de Quebec is one of the bets forts in Canada. Ensure to cruise on the various cruise ships. Our private Van will pick you up in the end. Carry up to a dozen passengers at the grace of your own pace, reserving a private van from area shuttle providers to cherish the old motif, slow and steady wins the race. Take that to heart at La Fontaine Park, home to shaded pathways and ponds, or walk through the waterside attractions of Old Port of Montréal, home to a blend of historic landmarks and modern leisure. Upper town is most famous for its rich history and beautiful architecture. Let our bus transport you safely. Take care of over a dozen passengers by reserving a chartered bus for your travels, moving across expansive locales like Boisé du Tremblay, a nature preserve on the northeast side of town, or take your time at The Montreal Museum of Fine Arts. YUL Airport is home to a large terminal with two levels, offering a wide selection of shops, restaurants, and amenities that turn the chaotic into something pleasant. - Level 1: arrivals, baggage claim, self-service check-in, security, currency exchange, teletype, changing rooms, taxis, car rental services, bus stops, restaurants, shops, and escalators/elevators to upper level. - Level 2: departures, check-in counters, self-service check-in, security, interfaith chapel, VIP lounges, information center, currency exchange, ATMs, teletype, restaurants, shops, hotel, and escalators/elevators to lower level. Use our maps to maneuver throughout the terminals for passengers departing or arriving at the airport. 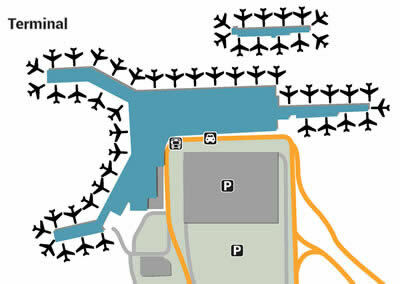 There are three main lots, Terminal, Economy and Indoor Parking. Terminal is closer to the passenger terminals. 11 miles west from the hustle and bustle of downtown, Montréal Airport barely grazes the edge of the city. Make getting around much easier by having a ride that knows the way, booking a shuttle from either area shuttle or taxi providers for the easiest option, getting dropped off where you need to be and picked up at the right time. Know where you’re going to get a sense of tomorrow, staying in the central borough of Le Plateau-Mont-Royal for artsy streets and tranquil urban parks, or go with the west side attractions of Ahuntsic-Cartierville, a conjoined region that hugs the Prairies River, offering easy access to lush nature and a popular shopping mall. For the edgiest of the edge, stay in Griffintown, an eclectic corner of downtown dedicated to gastro pubs and freedom of thought, while the crème of the crop can be seen at Rosemont-La Petite-Patrie, a borough that includes the city’s botanical garden, local food tours, and museums. See as much as your heart desires by not only making reservations, but keeping track of them. Print out your confirmation email for starters, also making digital back-ups of all important media and identification, from passports to important data that would otherwise be accessible only through your phone. Do so by keeping a cloud drive or thumb drive easily accessible, also considering organizers and travel journals for an easy rolodex of all things logistics. With half an hour’s drive that sometimes turns into 40 minutes, the trek between the airport and downtown Montréal can take its toll. Cut it by a fraction by meeting your destination in the middle, looking forward to comfy drop-offs with the help of nearby hotels, the closest options being the on-site Montréal Airport Marriott Hotel, which is connected to level 2 of the main terminal. Other nearby stays offer free shuttles, including Sheraton Montreal Airport Hotel, Aloft Montreal Airport, and Fairfield Inn & Suites by Marriott Montreal Airport. Enjoy your time at the airport through dozens of unique eateries, boutiques, and services that make time fly by. Food in the arrivals area (level 1) includes Subway, Tim Hortons, and John Molson Public House, while duty-free gifts and reading material are available at Relay. The departures area (level 2) offers much more across Canadian, American, and International halls, including eats at Sushi Shop, La Tapenade, and Urban Cave, with stores including jewelry from Joaillerie Metalsmiths, fashion at Boutique Arizona, and shades inside Sunglass Hut. A good thing to know if you’re planning to stay close to the airport is what’s around, whether it’s the old mansions and riverside shopping at the Pointe-Claire neighborhood or the transformation of snowy mounds into lush vegetation at Bois-de-Liesse Nature Park. A quick escape that’s especially close to the cluster of airport hotels along Côte-de-Liesse Highway is Windsor Park, an Alice-like space that looks out at the floating suburb on Dorval Island, a close runner-up being the just-as-scenic Millennium Park about a mile east. The largest city in the Canadian state of Québec, Montréal is a free-spirited island known for its c’est-la-vie art scene and vibrant French architecture that connects an array of scenic riverside neighborhoods. Explore the region’s love of parks, starting at Mount Royal, an urban peak that rests atop a hill, offering a look inside historic cottages, decrepit cemeteries, and the inspiring Mount Royal Cross above it all, afterward walking through the dozens of acres at Montréal Botanical Garden, its most famous moments being the Chinese Lantern Garden and adorned mother nature statue. Get a feel for the area’s unique architecture as well, looking up at the inspiring bright ceilings of the Notre-Dame Basilica one moment, admiring the modern ecosystems at Montréal Biodome the next. See even more of the past by spending the night in Old Montreal, and idyllic area offering a walk through the city’s most untouched alleyways, boardwalks, and promenades, or for something more family-friendly, escape into the island adventures of Jean-Drapeau Park, a pair of islands floating in the city’s central St. Lawrence River. The park is also home to prime views of the city through exciting rides at La Ronde Six Flags, waterside cafés, and cozy trails that lead to museums, an aquarium, and the Montréal Biosphere. Find a solid place to remember the area’s cuisine before you leave, grabbing a bite at the city’s most beloved eats, whether it’s the upscale French at Au Pied de Cochon or the trendy brunch menu from Restaurant L’Avenue. - Air Canada Maple Leaf Lounge: 3 locations throughout departures. Perks include free Wi-Fi, work stations, TVs, snacks, printers, copiers, fax machines, reading material, cell-free zones, showers (only available at international departures) and drinks, plus disability access and flight information monitors. - National Bank World Mastercard Lounge: Located at international departures. Perks include free Wi-Fi, reading material, TVs, telephones, fax machines, and drinks, plus disability access and flight information monitors. Economy is located farther from the terminals, offers low daily rates, and gives shuttle rides from the parking area to the front entrance. Indoor parking is available for affordable rates daily and are located within short walking distances from the terminal entrances. The parking lot shuttles are plain white or blue vans with the airport logo on the sides. There are eight rental companies available inside the terminal for rental car needs. These include Avis, Hertz, Budget and Thrifty. Most of the rental counters are open throughout the day and night. Please call ahead for reservations during peak holiday seasons.Taxi services are available at the airport. Outside the main terminal Canada bound flights is a dispatcher who will be able to call a cab for you and give you a list of current rates depending on location, number of passengers and baggage. The airport asks that you please speak with a dispatcher to find taxi services for your safety as they have contracted companies working with the airport. The 747 Express de Montreal is the local public bus that picks up passengers at the terminals and takes you downtown to the bus station. This bus runs 24 hours a day and stops at all three terminals. Rail Canada offers railway stops from the terminal to the main area of the city. Orleans Express is the recommended charter bus that takes passengers from the terminals to select destinations. Montréal–Pierre Elliott Trudeau International Airport located less than 15 miles from the center of Montreal, Canada. The airport accommodates more than 14 million passengers annually on more than 250,000 flights. More than 30 airlines pass through the terminal annually, including Delta, United Express and Air Canada. There are three terminals at this airport; one is for Canada bound flights, one is for international flights and one is for US bound flights. There is also a cargo terminal for cargo shipping companies, such as Ameriflight Cargo Airlines. Montréal–Pierre Elliott Trudeau International Airport offers passengers many comforts during their stay. Wireless Internet access is free for all guests and bathrooms are spacious, well maintained and clean. The Loop Shop is the duty free gift shop at the airport. There are several other gift shops available as well that are not duty free. There are ample dining areas available, including Tatami Sushi, Vino Volo and U-Bar, all of which are full service dining venues with full service bars. There are several currency exchange stations available. Luggage carts are available near the main entrances and the baggage claim areas and are free of charge. The airport recommends the Crowne Plaza de Montreal and the Hampton Inn de Montreal for hotel reservations. Both are less than ten miles from the airport, both offer complimentary breakfasts, spa services and fitness centers, and offer shuttle rides at no cost to the airport. Montréal–Pierre Elliott Trudeau International Airport is located at 975 Boulevard Roméo Vachon N, Dorval in Quebec Canada and uses airport flight code YUL.